C-Line Reduced Glare Economy Weight Polypropylene is the top-loading sheet protectors. The 11 x 8 1/2" sheet protector features the archival quality polypropylene, which means the print won't stick to the sheet protector and damage the document. The reduced glare finish will assist in better visibility under any office environment. You're certain to find a sheet protector that meets your needs, no matter what job you're trying to accomplish. C-Line's sheet protectors are available in a variety of materials and finishes and are designed to protect your documents day after day, no matter how often they're handled. Remember, with all C-Line's top loading sheet protectors-no sheet punching is necessary. Love these Review by P.
Transcript: Welcome to MyBinding.com. These are the Reduced Glare Economy Weight Sheet Protectors from C-Line. These 8.5x11” sheet protectors are made from archival quality polypropylene to protect your documents and photos against sticking and print transfer. The texture of the material acts to reduce glare for easier viewing under any lighting. The binding edge is 3-hole punched for standard binders, and reinforced to resist tearing out on binder rings. For all your document that need lasting protection, choose C-Line sheet protectors. Welcome to MyBinding.com. 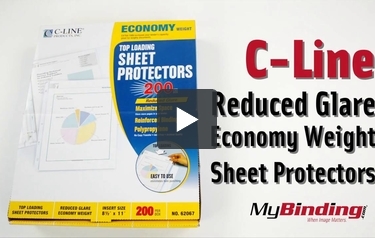 These are the Reduced Glare Economy Weight Sheet Protectors from C-Line.